Below are answers to the most frequently asked questions about the Diploma of Equine Podiotherapy. If you do not find what you are seeking, please contact us. The first block usually commences in February. Please contact our Administration office via the email link above or phone 03 5773 4358 during business hours for more information. Don't delay if you are serious about attending. places are limited due to the intense hands on nature of this course and courses usually fill months prior to commencement. Four equal payments are due three weeks prior to the commencement of each block. We cannot accept upfront payments. Please contact our office for details. Course notes for each study block will be released to students via the student log in section of the ACEP website once payment for that study block is received. Student login will be disabled until payment is received into our account. Who can train as an Equine Podiotherapist? Anyone who is over the age of 18 who feels that they are fit and well enough for an outdoors lifestyle working with horses. Do I need a hoof care background to take these courses? No particular previous background in hoofcare, equine health care, or farriery is necessary. Even if you are a novice trimmer you will gain all the skills necessary to become an Equine Podiotherapist. But....this is an anatomy based course so as well as hands on trimming there is study involved too. The course is delivered over two years. The first year consists of 4 blocks of face to face lectures at the campus at Yarck and distance learning modules. You then have another year to complete a portfolio of 16 case studies. After these are assessed you will then become a graduate and gain your Diploma. Will I have to do dissections? Yes. Practical trimming is done on both cadaver hooves & distal limbs. Places are limited. The student numbers are deliberately kept small so students have plenty of support during their training. For all the hands on trimming classes with live horses we have two instructors present ...... so you have hot and cold running help all the time!. It is pronounced equine pod-eye-oh-therapy. Its basis is the word podiatry meaning of the foot. Are there grades or credits to be gained? The course has been constructed by a professional course writer to meet Australian standards and has recently been recognised as a Nationally Accredited Diploma Course (22290VIC). We are partnered with CEACA, our RTO (Registered Training Organisation) and from the February 2016 intake, graduates will obtain national accreditation. Previous graduates will be eligible for RPL (Recognition of Prior Learning) to upgrade their qualification to a nationally recognised Diploma. There are assessment tasks and standards that must be met to achieve your Diploma. You will also have to complete a portfolio of case studies as part of your training to Graduate. These are completed during the second year. The accreditation is a Nationally Accredited Diploma of Equine Podiotherapy from the Australian College of Equine Podiotherapy. Students and graduates are also able to join the Equine Podiotherapists Association. Is the college a private college? Yes, the Australian College of Equine Podiotherapy is a private college. We employ lecturers who are experts in their fields to guarantee the quality of our courses. Can veterinarians attend and do they gain AVA Ongoing Education Points if they attend? Yes, the Diploma of Equine Podiotherapy Course can offer ongoing learning points with the Australian Veterinary Association. Veterinarians who have attended have found the information offered invaluable in their practice work. All have said that they wished that it could have been part of their veterinary studies and said that they would recommend this course to any veterinary colleagues who might be considering attending. Should equine body workers/therapists attend? Absolutely yes! The majority of the equine's musculoskeletal issues stem from adaptations due to painful poor hoof form. Even if you do not want to be a professional trimmer unless you can assess the hoof and know if it is dysfunctional and painful and causing secondary body issues how can you offer the horse total rehabilitation. It's wonderful to be part of a total solution. This is an opportunity to expand your skills and learn highly successful techniques for dealing with navicular syndrome & laminitis, and to hear the latest research. Your clients will expect you to know barefoot rehabilitation techniques. No horse now needs to undergo painful corrective shoeing for navicular syndrome - learn why.... it will change the future for many horses in your care. Is this new career path covered by insurance? Yes. The modality of Equine Podiotherapy is able to be covered by insurance. As a career the modality of Equine Podiotherapy is able to be covered by certain insurance companies. Student cover for Professional Indemnity and Public Liability insurance whilst studying and working on their case histories, is available should students wish this. Can anyone call themselves an Equine Podiotherapist? The title Equine Podiotherapist is trade marked and owned by the Australian College of Equine Podiotherapy. Only those who successfully complete this course and gain their Diploma may be called Equine Podiotherapists. I have already done an accredited barefoot trimming course, is Equine Podiotherapy the same? Equine Podiotherapy has been constructed as a Diploma level course with in depth course content. It is unlike any other course taught in Australia at this time. Many of our students have already previously completed other barefoot trimming courses, but have undertaken Equine Podiotherapy too as they wish to extend their knowledge of the hoof & the equine to a deeper level to enable them to do more effective rehabilitation work. What does the EPT course cost? See Curriculum, Campus, Fees. Fees are subject to change. The course is classified as full time and is designed to be completed in two years. In the first year, the course is delivered in four intensive 6-7 day blocks of face to face lectures and practicals complemented by distance learning modules. Assignments are to be completed between the blocks. Students then have to complete a series of case studies within their 2nd year. 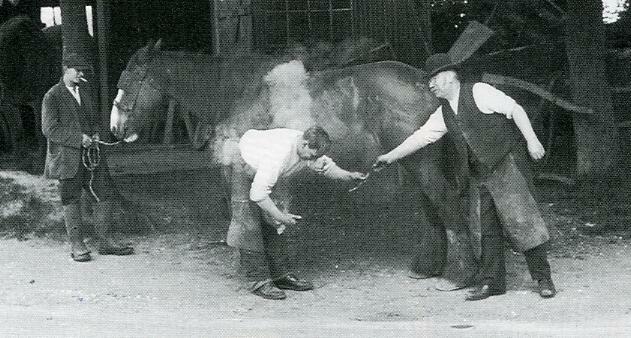 Students need to supply their own trimming gloves and it is a condition of the college insurance that students must wear an approved (Australian Standards) safety riding helmet during the handling of live horses. Loan tools and farrier aprons are available from the college but if you are travelling by car, please bring your own if you can. Gloves, aprons and a large inventory of trimming tools are available for purchase but not safety helmets. Victorian students may be eligible for the Skills First program but students need to be aware that it may impact students wishing to undertake further government subsidised training. 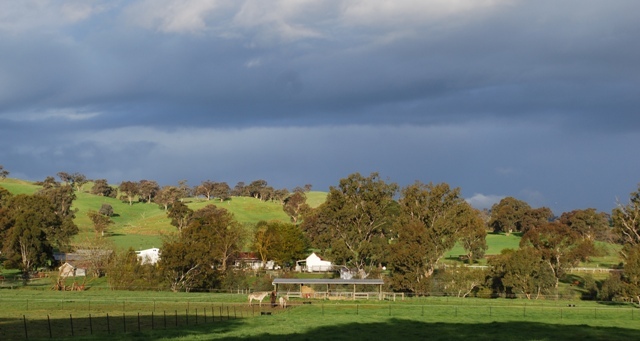 The course is delivered at the college campus at Mayfield Barehoofcare Centre in Yarck in rural Victoria. The campus & rehabilitation centre are pictured below. The campus offers air conditioned classrooms, toilets & showers and a pool for students' use in the summer. There is "The Bunkhouse" accommodation owned by Mayfield farm available on the campus & camping facilities with camp kitchen, toilets and showers available too if students wish to camp on this lovely property. There is also a full range of accommodation at Yarck and at Alexandra which is 20 minutes away. Many of our students attend from interstate. The college can assist you with finding accommodation and put you in touch with other students via a private chat group so you are able to arrange to car pool etc. prior to attending if you wish it.